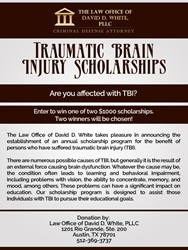 An annual scholarship program has been established by the Law Office of David D. White, PLLC to benefit persons who have been affected by traumatic brain injury. Two scholarships of $1,000 each will be awarded annually, and the awards will offset a portion of the cost of tuition at the educational institution chosen by the successful applicants. Austin attorney David D. White, and his law firm, the Law Office of David D. White, PLLC, have announced a new scholarship program to assist persons who have been affected by traumatic brain injury. Traumatic brain injury (TBI) is a complex injury. It has a broad array of symptoms, and a wide variety of disabilities. Traumatic brain injury applies to head injuries that result in impairment in one of a number of areas. Those areas include memory, concentration, abstract thinking, problem-solving, information processing, and others. These difficulties present educational challenges for those affected – problems taking tests, learning new skills, and grasping complex instructions. The aim of these educational scholarships is to help those with TBI in pursuing their goals at the educational institution of their choice. The funds will be available to defray tuition costs at a university, college, trade school, junior college or secondary school. In this way, Mr. White hopes to provide the incentive for the successful applicants to further their education.